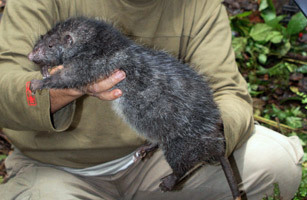 If rats make you squeamish, it's best you avoid Mount Bosavi on the island of New Guinea. That's where a team of scientists, academics and filmmakers from the BBC Natural History Unit went early this year to explore for unknown species. The towering crater walls of this extinct volcano are so high and the mountain so remote that biologists wagered they might find unique creatures. They hit the jackpot. Among their discoveries were an unusually hairy caterpillar, giant butterflies and tree kangaroos  but the best (or worst, depending on your taste) was a gigantic rat, nearly 3 ft. long and weighing more than 3 lb. Fortunately, the provisionally named Bosavi woolly rat appeared to be vegetarian and quite docile.